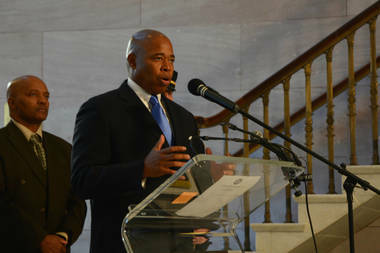 Borough President Eric Adams is calling on the School Construction Authority to identify sites for new elementary schools in Downtown Brooklyn. DOWNTOWN BROOKLYN — A tidal wave of school overcrowding could be headed to Downtown Brooklyn unless city education officials act now to start building new elementary schools, local leaders are warning. New school construction isn't keeping pace with the "historic and unprecedented amount of development growth," Borough President Eric Adams and other Brooklyn leaders said in a Dec. 9 letter to the School Construction Authority. "Unless action is taken now to build new space to address this shortfall, Downtown Brooklyn could be in the midst of a major school capacity crisis," the letter states. The letter, addressed to SCA President Lorraine Grillo, was co-signed by Adams, Brooklyn Chamber of Commerce President Carlo Scissura, president of Downtown Brooklyn Partnership Tucker Reed and Councilman Stephen Levin. Downtown Brooklyn's residential population has almost quadrupled in the past 15 years from 5,733 in 2004 to more than 20,000 now, according to the letter. "[W]e strongly encourage the SCA to announce your desire to site a new elementary school or two, and work with us to utilize our relationships with the real estate community and expertise of the local marketplace to help identify potential school development sites," the leaders wrote. The neighborhood is currently served by P.S. 20, P.S. 38, P.S. 261 and P.S. 287. While two of four elementary schools — P.S. 261 and P.S. 287 — are currently under capacity, by 2017 the neighborhood is expected to absorb more than 4,000 newly occupied apartments and 1,164 new students, leaders said. That number dwarfs the present capacity of the schools and "vastly underestimates" what the SCA has accounted for in its current capital plan, according to the letter. There are 7,790 apartments slated to begin construction in Downtown Brooklyn by 2020, but the SCA only projects 9,795 new residential units for all of District 13 and 15, which stretches to Sunset Park and Bedford-Stuyvesant, they wrote. They also noted that some developers had expressed interest in building schools within future projects. According to the DOE's five-year capital plan, funding has been secured for 1,090 seats in District 13, which includes Downtown Brooklyn, but the location of all those seats was not immediately clear. The DOE said the agency is "committed to addressing school overcrowding and are continuing our dialogue with the CEC, families, community members and elected officials."